Laser cutting takes what we engineer at the desktop and brings it out into the real world. For a luthier, this enables creating our most common working tools - router templates - to be made simply yet precisely. A real game changer! Translating creative or technical design work into router templates opens up a world of design options. Anything from an accurate outline of your body/headstock, pickup and electronics cavities, through to complete modular templating systems for recessed tremolos, etc. Powerful desktop design tools and laser cutting takes your building to the next creative and technical level. "Having it laser cut" sounds like a magic bullet of sorts; draw something up and having it drop out of the other side with little to no real effort. That's not actually too far from the truth; the technology is definitely more usable and accessible than it ever had been. The key to winning lies in mastering a number of simple fundamentals and managing a few basic expectations. Once you've moved beyond these, laser cutting becomes a very workable part of your armoury and one that you'll always find new ideas and challenges for....and like any tool, it is only as good as what you make of it! 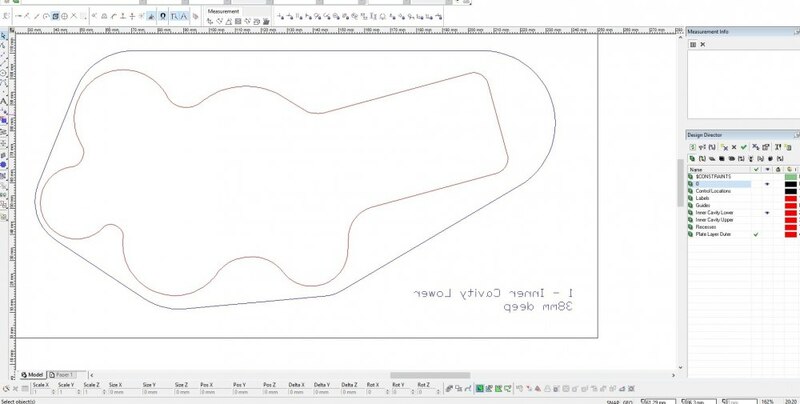 The focus of this article will be on how to locate and choose the right laser-cutting service, illustrate the desktop work necessary to produce drawing files that are pretty much good to cut and finally show a couple of real-world working examples. We are making a few assumptions here. First is that you know basic vector work (AutoCAD or other CAD packages, Illustrator, Inkscape, CorelDRAW, etc). Secondly, that you are more or less familiar with manipulating vectors, managing object types, inspecting and changing their attributes, etc. with your chosen vector drawing package. Beyond this, laser cutting is a pushover! Okay, well we have two options for getting our templates made. First - getting your hands dirty at a Makerspace, Hacklab, community college/educational facility or wherever else offers public/membership access to a suitable laser cutter. By far, this is the best way of extending your skill set; your time can be spent fine-tuning (or replacing!) your templates hands-on. You have end to end control. This might be a bit more costly in the short term; mandatory safe usage courses and basic fees are a necessary price to pay. You'll probably burn through a lot of material (joke not intended, but apt) in your first attempts too. It's definitely a swift and easy complete control solution once you've ticked those boxes, and the cheapest route for the habitual user. The scope of this article is not intended to take any precedence over the advice you're given during laser cutter induction. Every location will have its own set of house rules, so rely on their expertise and recommendations. Every laser is different, every facility is different. The tutors who do this are your gurus, so drop preconceptions and let them guide you. The other option is reliance on third-party services. These can vary from brick-and-mortar shop/bureaus like Mostly Out Of Cardboard, turnkey online services such as Ponoko or specialist guitar supply companies with in-house custom laser cutting such as Guitars and Woods. Third party services are not necessarily an inferior choice or even an expensive one, however you do need to shop around for a service which understands your requirements and preferably does this work all of the time. Your local trophy maker "who happens to have a laser" might charge you well over the odds for the inconvenience of reconfiguring their machine for a one-off sheet job, however simple. It might simply not pay as much money on the hour as their normal line of work, or be an alien process to them. Even a shop signage maker who cuts sheet day-in day-out might not offer an attractive price on small one-off jobs. Third-party services have the advantage of experienced operators, and you should use that. Ask if they've cut templates for luthiers or woodworkers before. Familiarity - or at least an understanding - of what you're wanting to achieve is 90% of the battle won. If they've done anything similar before, they might be able to suggest improvements on your basic design for future work or simply snag any errors in your work submissions. If they haven't, gauge whether they're open to the idea of what you're wanting and understand its purpose. Companies that are genuinely interested in your product and having you as a satisfied customer are worth fostering a relationship with....as long as that isn't simply a way of sleazing deeper into your wallet! A lot of creative and inspirational people work in laser cutting services, Makerspaces and community colleges. Often the opportunity to collaborate on something new and exciting (as exciting as router templates get?) is more important to them than a bit of time or turning a quick buck. Some operators are genuinely excited just to see new things come off the laser and might be happy just for the cost of materials. "Head towards the people that have that creative spark and not the jaded old farts who might just see you as an inconvenient interruption to their non-stop conveyor belt of boring paint-by-numbers imported Chinese component school sport's day trophies given out just for participating rather than representing real achievement." The people you need to be on friendly speaking terms with from day one are the keyturners or regular users, whether they're engineers on the other end of the phone, colleagues, Makerspace tutors or fellow denizens; whoever. Laser cutting is a fairly simple process with a few hidden tricks and obstacles you need know before you encounter them. Communicating your needs and existing knowledge will produce a smoother process from your desktop to the finished item. There are basic conventions within drawings which denote how the laser driver will interpret the job. We'll look at these later, however you should ask your service what their own in-house conventions are, or check with the other people in your Makerspace, etc. how to set up the drawing appropriately to work with the default laser configuration (this should be covered during safe usage courses). Firstly this saves time fixing things in the mix, or worse, trashing good material. Most importantly it may ease third-party setup charges if your drawing is good to go straight to the laser. It definitely gives you room to negotiate that cost. It has to be borne in mind that services will likely operate an hour rate on setup. These charges are superfluous when a drawing is poorly designed or doesn't conform to house protocols and needs the attention of an engineer or operator! We have a dedicated thread on laser cutting over on the Forums. If you're wanting to send jobs out to cut, but are unsure on whether your design is completely appropriate for that purpose, join the conversation and we can fix most things up! Not all Makerspaces or third-party services have a full selection of materials on-hand. Prices may also vary due to wastage, availability and basic markup. Plywood designed specifically for laser work tends to be more expensive as it has to be free of knots and voids, plus needs to use glues safe for laser cutting. Acrylic will be (well, should be) tempered cell cast due to problems with cracking and poor finish quality with the extruded variety. The right materials cost a little more, but produce infinitely better and more durable results. Thicker materials can come with unexpected side effects, such as larger kerf (width of cut left by the laser) sizes or cut edges which are not perpendicular to the face. Thinner stock is a more accurate choice for closer-fitting parts. This is a good subject to discuss with the users/owners of the laser; if theirs has the right optics and power to cut 1/2" acrylic perfectly then go for it! Ask for advice on choice and comparative costings with stock materials; you might even get a great deal on a job if something can be pulled from the offcut bin. Asking the question costs nothing and can save you a significant amount of money. More than likely you'll do your design work away from the site where the laser is located, and probably using different software also. Modern laser cutter drivers are far more forgiving of input formats than they were a few years ago, however that isn't to say that every bug has been rattled out. Choosing the most appropriate format for file exchange from your machine to that of the laser is vital. If you're going third-party, as what their preferred file format is and perhaps what software they are using; if you both happen to be using CorelDRAW you can cut out unnecessary conversion steps and swap native file formats directly. I prefer DXF (Wikipedia) simply because it is the most common and interoperable file format for vector information. The same rationale applies to other packages (Inkscape, Illustrator, etc) where exporting to a widely-supported basic file type removes most common errors from translating across formats. If you're using a third-party service, ensure they are aware which cut pieces you're actually needing from the job. 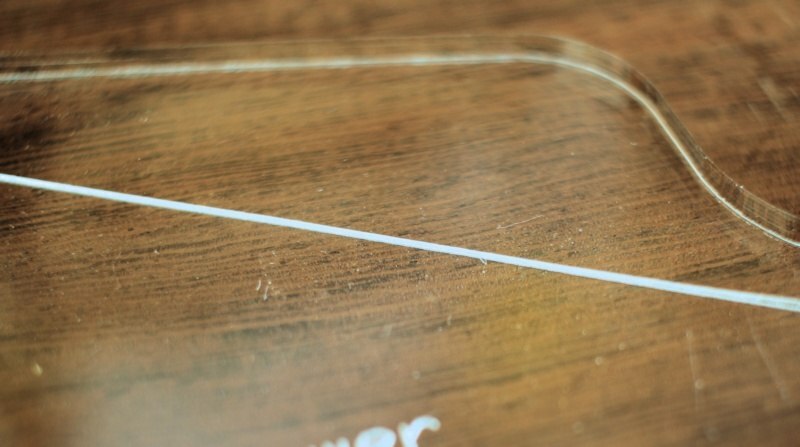 A negative space router template (such as a pickup cavity) may not be immediately obvious, leading to problems where you receive a "Tele pickup shaped piece of Masonite" in the mail instead of the surrounding template for cutting the cavity! Explicitly stating, "This is for a 200mm x 150mm rectangle of Masonite with that shape cut out" makes all the difference. 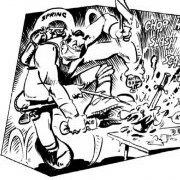 For more complex jobs where you are needing both the negative and positive components from the cut, again, state this from the outset. It saves a lot of time and hassle. Not all laser services will know what a router template is or its end use. Obviously this is less of a problem when you're cutting work under your own steam. One issue that might crop up is when cutting out fine components. Air assist which prevents flareups will happily blow your valuable but newly-loose parts around the bed, or worse, into an exhaust port! A little double-sided tape under the material in the right places and the use of a spoil board underneath helps. Whilst this isn't a communication issue, double-checking with a third-party service that they use the same kind of approach is. Keeping a design as simple and to the point as possible wins the day. Only add as much information as the templates really need. The true test of a template is in the quality of the workpiece it produces; not how tricked out the template is with text, logos and irrelevant detail. This is especially important if the service charges by time or in the case of Ponoko, a function of total laser work movement length! Going through your design from top to bottom pays off. Common problems that are not immediately apparent can be revealed by developing your own methodical approach to validating your designs. Acrylic offers us a great opportunity to add engraved markings that can be seen through the template itself. The problem is that lasers cut from the top down. This just requires that the finalised design is mirrored prior to sending out for cut so engraved text will appear correctly when viewed through the template, plus alignment marks lay directly next to the workpiece. Opaque materials such as Masonite or MDF may be difficult to reconcile with alignment marks such as a centreline; after all, engraved marks will be placed onto the top surface of the template and we can't see through the material like we can with transparent acrylic. For most cases, this is not too problematic; we can add additional auxiliary cutouts within a template to assist with alignment where it might not otherwise be possible. 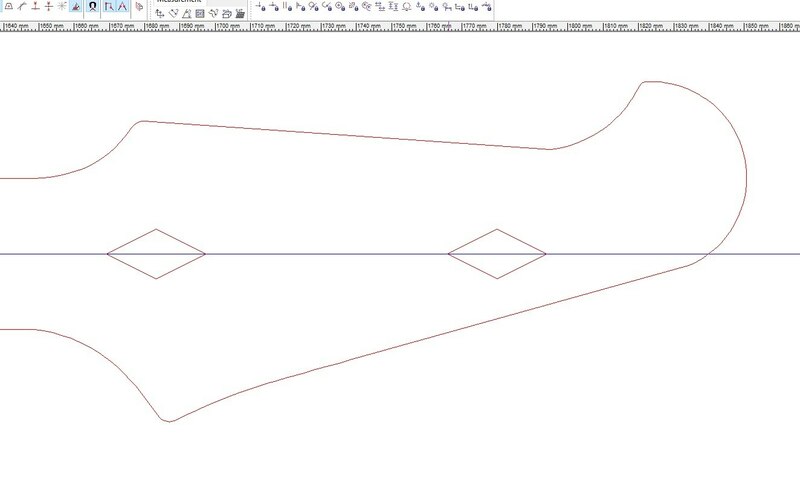 In the example above, diamond-shaped auxiliary alignment cutouts allow the template to be placed accurately on a marked centreline using internal corners rather than approximating from a top-engraved marking at an oblique angle to the edge. This is also invaluable for alignment on angled headstocks, where the centreline falls away past the nut area. Use of separable layers improves workflow. 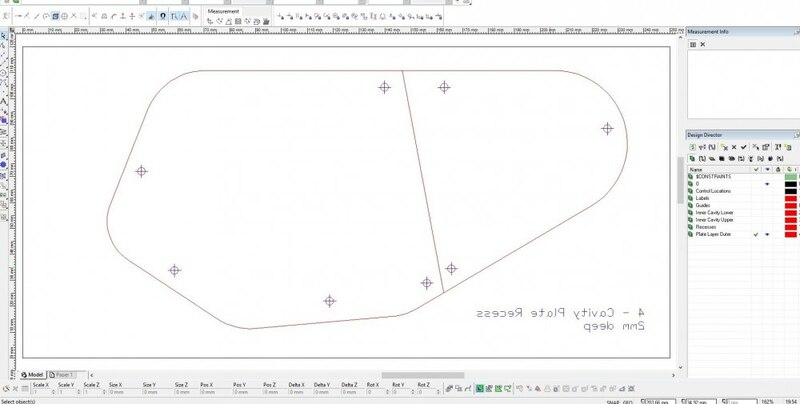 Placing all engraving work onto a separate layer to cutting makes it a simple task to confirm that paths are not duplicated, incorrectly set and properly aligned, etc. Colour within the drawing is used as the primary guide for different laser settings. Most laser driver software can be configured so that many different colours to represent various combinations of speeds, powers and duty cycle frequencies. The accepted basic standard is that red (RGB 255,0,0 - #FF0000) represents a cut and blue (RGB 0,0,255 - #0000FF) represents an engraved line. If using a third party, confirm their house rules and conventions on colours and whether line weight is a consideration. My personal arrangement is to use black (RGB 0,0,0 - #00000) to denote the rectangular working outline for larger negative templates. Some houses may interpret this as an engraved mark unless it is explicitly stated that black represents a cut. Ensure that your drawing objects are explicitly set to the correct colours, not simply "By Layer". If your software has the ability to "select all items by colour", this helps with confirmation. Another check is altering layer colours to something unused, such as bright green.....if any objects are set to follow colour by layer, they'll stand out clearly. Laser cutting produces small but still significant kerfs, or the "width of cut". Several factors such as material type and thickness affects the final size of kerf, however it is usually in the region of 0,15mm for thinner materials. Confirm with the laser operators what the expected kerf size of the material you are working with is, or make test cuts and physically measure it yourself. A typical kerf is in the region of 0,2mm and equates to an offset of around 0,1mm from the expected drawn outline. Kerfs are hardly worth concerning yourself with for headstock and body templates, and in fact it works in your favour for bolt-on neck/heels. Other precision joinery Items that require a tight conforming fit - such as set neck joint templates - will need test cuts to be made and the templates proofed for suitability. Offsetting the mortise half the kerf size smaller and the tenon half larger is a good start, however the proof is in how well the joints routed using the templates mate together. Adding in a larger offset than is necessary is also an option. It's better to fine tune the wood with some sandpaper than it is to have it loose straight off the router! Many of the design tools in various CAD packages produce complex objects that are often handled in a manner specific to that package. 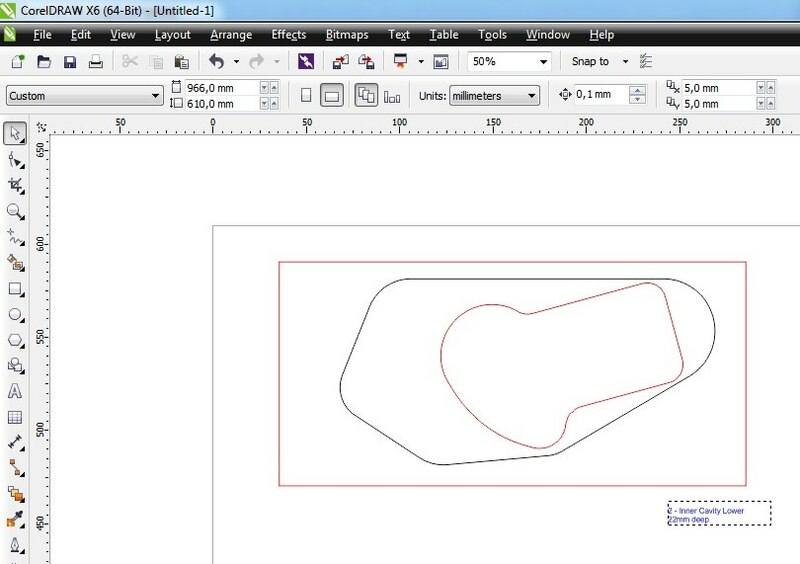 For example, different types of curves, mathematically-generated contours or even text objects. Unless you are working in the exact same software that outputs jobs to the laser, the two different packages can have radically-different opinions on what how your work is supposed to render, resulting in incomplete or incorrect cuts by the laser. We can work through this by taking complex items and devolving them down into basic objects (called Primitives) that are unambiguous and are rendered equally by all software packages. It might not seem immediately obvious that any kind of problem might exist here other than the font being solid rather than an outline. Times New Roman is a vector font, which might seem pretty universal to most systems. However, once this work is saved out to the common DXF format and re-opened in the software used for the laser (in this instance CorelDRAW for an Epilog platform) we see that the font has been substituted to a completely different one, and is no longer mirrored as in TurboCAD. How to we prevent file format exchange errors such as these? CAD packages have all kind of tools for producing high-level objects. Underneath it all, these objects are still built from a basic set of Primitives, such as lines and circles. Instructing your software to take each high-level object and strip away the complexity varies from package to package, however is usually called Explode. In the example above, taking the text object in TurboCAD and Exploding it down into Primitives should allow any other package to interpret it correctly. Often this will need to be performed more than once depending on the object being Exploded. 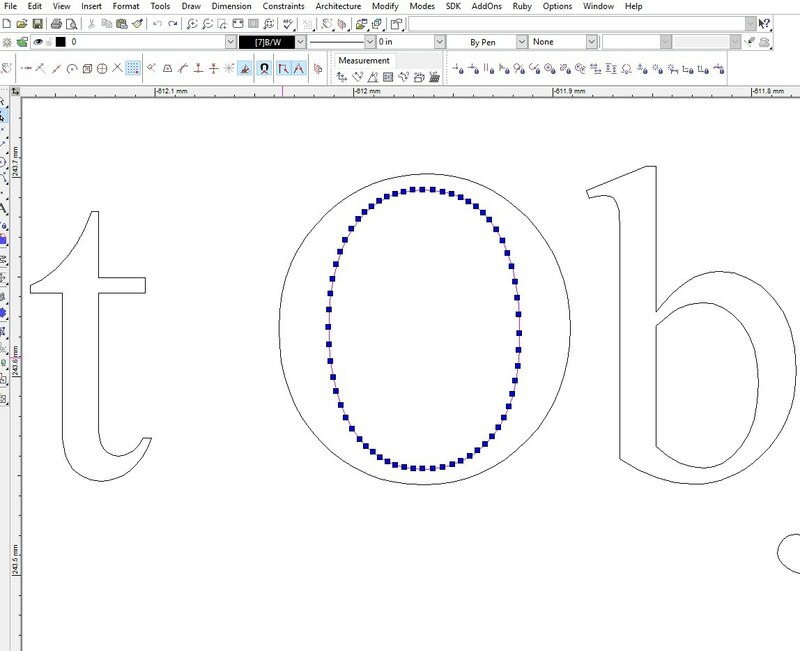 For TurboCAD, this needs to be carried out twice in order to devolve the Text object to a single Group of objects, then down to individual Primitives (normally Polylines). However your own software works, inspect the objects to figure out whether they need Exploding further. Some objects such as characters within Text may Explode down into two individual parts; the fill and the outline. Deleting any fill prevents duplication of the same object, since we only need text character outlines. click to enlarge - a letter "O" Exploded down into internal and external polyline shapes. It is also worthwhile considering Exploding curves; whilst simple curves normally render correctly between different software packages, they usually cause the laser head to move slower than with sets of lines as the driver interprets the curve mathematically. Exploding a curve down into discrete Polyline objects is recommended to reduce job complexity and increase speed. Before committing, compare how granular a Polyline is in comparison to the original curve. Most software allows you to define how finely a curve is broken down into a Polyline. For most jobs, a cut made using Polylines is indistinguishable from one made with curves. Once you have a better understanding of which objects translate well via your chosen file exchange format, you can Explode only the ones that don't. Ultimately, if the end product cuts quickly and efficiently, breaking your drawing down to its absolute basics prevents unexpected bugs from creeping into your designs. A few months ago, I sent out a quick turnaround job to Henri at Mostly Out Of Cardboard (MOoCB) for some acrylic pin routing templates. The files were supplied as individual DXFs. Each holddown consists of an outline plus several holes used for aligning and stacking pieces together. 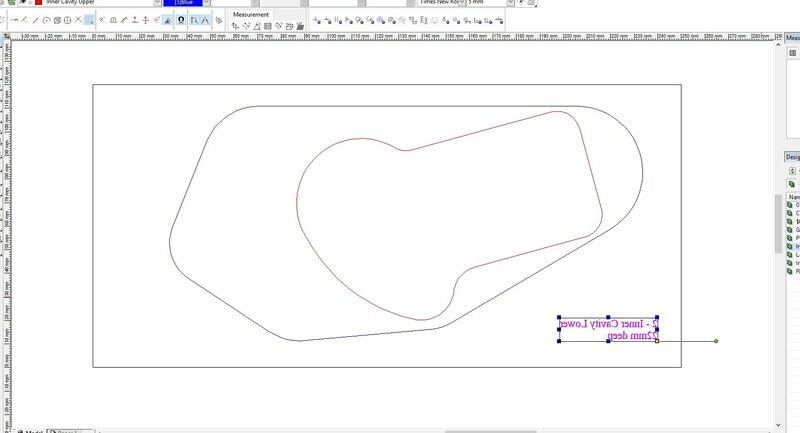 Henri simply imported the DXF files into CorelDRAW, set each outline for the appropriate cutting settings in the laser job driver. Being extremely simple, Henri was happy to accept the DXF files as-is straight from my CAD package and set colours for cutting, etc. at his end. This was an extremely simple job, which required very little back-and-forth communication. Henri is experienced at cutting a great number of different materials, so three small acrylic components was a walk in the park. In fact, I asked for "whatever light acrylic stock" they have on hand which resulted in these 4mm. A job such as this is mostly material cost with minimal setup time; even the packaging is only a minute job on top of the parts themselves. Like any job, there will be a degree of setup on some level, whether it be a complete treatment and check of the vector file sent (some bureaus insist on this, and make the charge mandatory...) copy grouping parts for efficient batch cutting or laser configuration (origin locating, focusing, etc) prior to running the job. The templates worked fantastically. 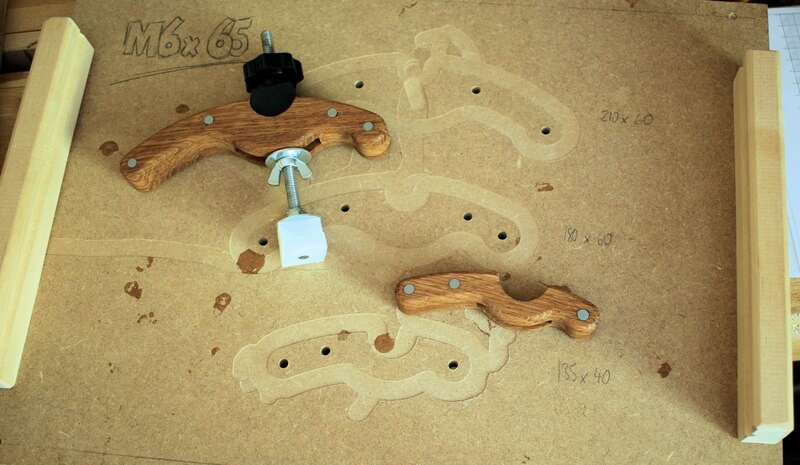 8mm-thick Oak blanks were pre-drilled and bolted down to the sled and shaped using an overhead pin router. The templates seat underneath and the pin rides against them. A very simple and neat use of laser-cut templates! Anybody that knows me enough will be aware that I think far too much about the classic basses that came out of the Matsumoku factory in Japan from the late 70s to the late 80s. The most known of those is the Aria Pro II SB-1000 with its tank-like dual-mode 18v electronics and recognisable signature sound. A slow-burning project of mine has been to make a more or less authentic replica of the SB-1000, but with altered specifications....and a fifth string. The electronics cavity is something I'd like to replicate rather than make "similar to", so I recorded the measurements from a real SB-1000 and drew the cavity up in CAD with a few basic improvements and some cleanup. An original SB-1000 electronics cavity, bereft of life. Whilst not the most elegant or precise of electronics cavities, the space for the preamp module and batteries, plus the recesses produce a nicely-organised electronics cavity that isn't thin and weak like most "swimming pool" cavities. I figured that a set of four templates would be perfect. 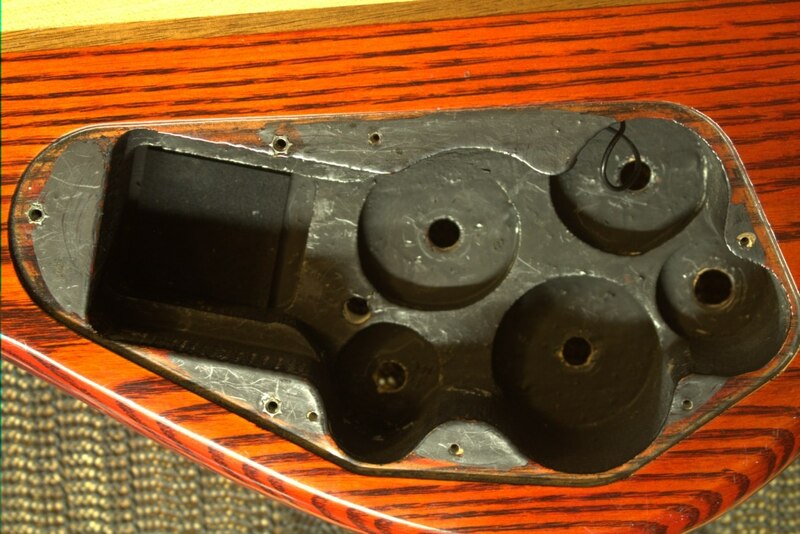 The first being the main outline of the cavity cover recess and cover plates (the plate is split into two pieces), a template for the main "body" of the rout down from the outer cover plus the narrower part of the battery/preamp niche, an auxiliary template to produce the wider ledge either side plus a template for the recesses. Since these templates are all related to each other, I decided that it would be useful to have engraved alignment markings on the lower face along with some basic information to remind me what to do (or not to do). As mentioned previously, lasers only cut from the top down, so engraving on the lower face means these will all need to be cut in mirror image. A vector line font was used for the text for both clarity and simplicity. Screwhole locations were marked with 2,5mm diameter circles with Point objects (crosses) engraved in their centre. The Points were Exploded down into Line pairs. A potential issue would be duplicating the cavity cover split Line. Since I drew the whole outline and added the split later, this was no problem. A look at the layer manager ("design director") shows that I defined several layers for this project. Each one contains references and guidelines, text labels or the work for the laser. This helped me create a template set from one master drawing, with the organisation allowing me to work on all of the templates as a group or individually. Turning on all of the layers shows how everything was designed. A bit of a nightmare when you look at it like this, but it works! 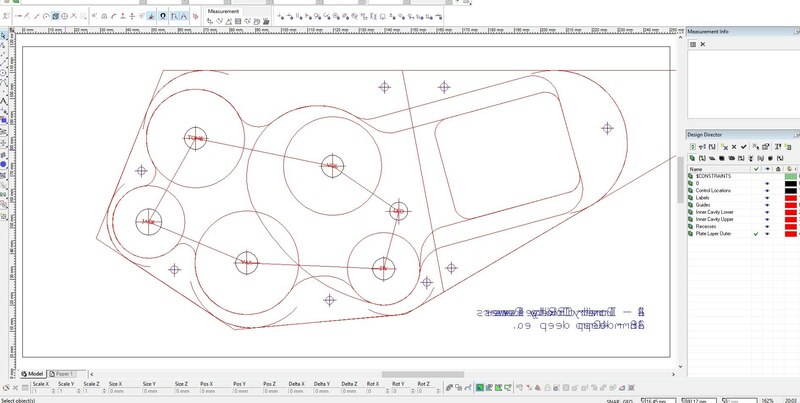 TurboCAD allows me to electively export specific objects to DXF files, so I selected the objects relevant to each template and sent them out to four individual DXF files. As you would expect, all Text, Arc, Point, etc. objects were Exploded to Lines and Polylines. I contacted Guitars and Woods to produce my template set in 5mm acrylic along with a few different designs. G&W sell templates for many common guitar designs (Strat, Tele, Flying V, etc.) and do all of their cutting in-house. Since they know the product and a luthier's needs, it seemed perfect to use them for these templates. So here's that first template described earlier. The alignment crosses and text appear the right way around and are engraved on the underside. Each screw/threaded insert location has the small hole for punching and the alignment marks. I used the kerf of the laser (~0,15mm) to my advantage; the cavity cover plates will drop in perfectly. ....due to how the other templates were designed. The outline of the cavity cover recess is replicated here as an engraved reference on the underside. By aligning this with an outline drawn using the first template (or marking off the outline since the templates are all cut from 250mm x 120mm pieces!) we have an accurate placement for each subsequent template. The auxiliary template is shaped similarly, but is only used for the battery ledge. I labelled the templates 1 through 4 and added pertinent routing information to each one. In most instances, these templates would be retained as "master templates" and copied across to a thicker sacrificial material such as Masonite, plywood or MDF. Access to and use of laser cutting services is far easier than you might expect. Maker culture has gone a long way towards normalising this sort of technology almost into everyday life; taking advantage of that as a luthier is a simple and economical step in taking your work forward in huge bounds. 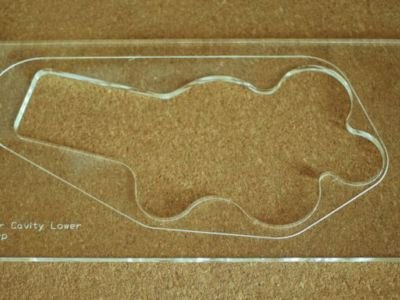 Over on the ProjectGuitar.com forums we've opened up a Laser Cutting Discussion And Advice Thread. We hope this article has inspired you with new ideas and methods of producing your instruments; ask anything you want about laser cutters, designing templates or components, CAD-related issues or even service recommendations. This article was made possible by the generous donation our our Patreon supporters, plus invaluable input and assistance from Henri at Mostly Of Of Cardboard and Carlos of the Guitars and Woods web store. If you enjoyed and benefitted from this article. become a Patron of ProjectGuitar.com and help us bring you even more articles, tutorials and product reviews like this, week-in week-out! 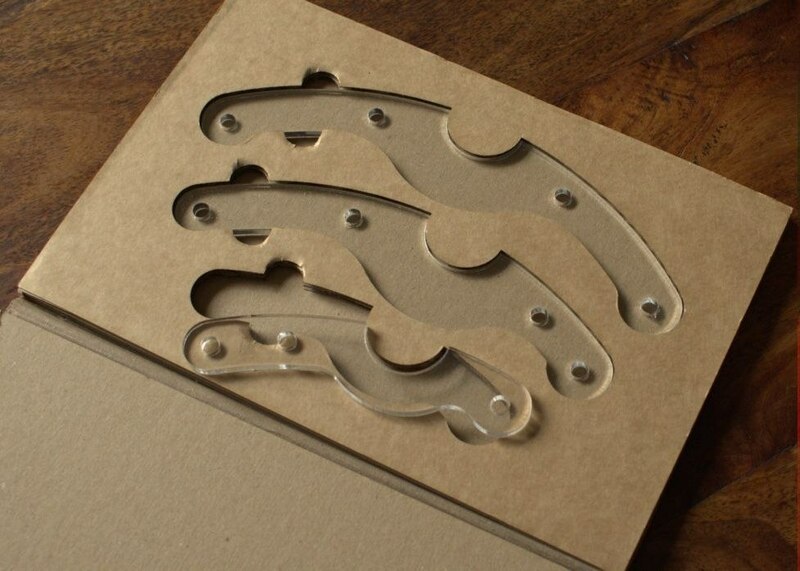 Laser Cutting Router Templates - Painlessly by Carl Maltby is licensed under a Creative Commons Attribution-NonCommercial-ShareAlike 4.0 International License. Great article, and I actually got a great idea from it. Next time I make a part on my laser, I will throw in a pc of cardboard and hit start again to make shipping holders for the part just made. I encourange any luthier or wood shop to look into lasers. I budgeted $30 grand to get one, and after searching I found one for less that 12 grand. The good chinese lasers that have US based tech support can start at 5 grand. Well within a budget, considering how much time they save and the freedom they provide. I laser many of my router templates from 1/4" baltic birch plywood instead of acrylic due to its stability, lack of cracking, and easy to screw through. A laser - in the right shop - can more or less print money. They're a real case for business development, and if anybody has the idea, they can make a 30k laser pay for itself in less than a year.